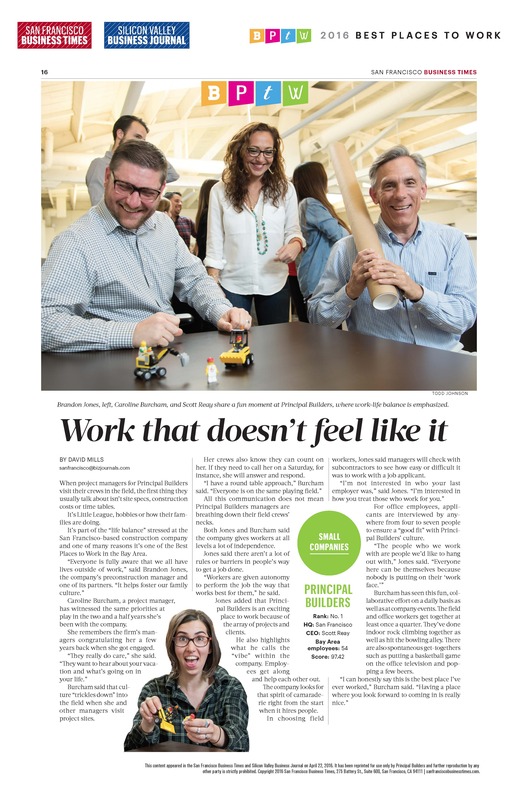 We are honored and humbled to be ranked as the #1 “Best Place to Work” in the small companies category by the San Francisco Business Times. What an incredible moment… for our people, our customers, our partners – this is for you just us much as it is for us. We’re here because of your commitment to us. It is even more meaningful because it was always by design, not by default. In 2003 we founded Principal Builders with a vision to change the construction industry. We wanted to create a culture rich with perks, flexibility and opportunity, a place where people wanted to be – every day. So we approached hiring with the belief that that personality and shared values are more important than résumé. Thirteen years later, that belief still holds true. Happy, motivated, engaged team members are what set the standard for excellence. And we believe our clients benefit from this in every way; from the big picture thinking to the day-to-day problem-solving, and ultimately to the built environments we deliver. It is a privilege to attract the talent we have and to serve the customers who continue to refer us, over and over, and build our name as we build their headquarters.